Great light and color. Love the details that create even more interest; ie, vintage tv antennae which has now been replaced by a dish or the light hitting the railing. 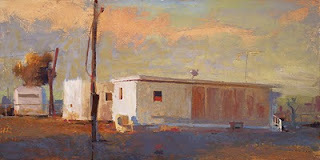 O-o-o-h, another Bombay Beach painting. Such deceptively 'simple' comps can be really hard to pull off but, of course, you have! Love this painting, Bill!! I'm typically just a lurker on your blog, but this one compelled me to post. The two things that really get me on this one are 1) the orange/pink vein running through the sky (probably a favorite amongst many), and 2) the small dab of red in the window. It recalls the JMW Turner painting Helvoetsluys with the small red barrel in the ocean that offsets the otherwise muted painting. Hi William, very good picture, with a color harmony impressive, congratulations. Proof that you Can put perfume on a pig.... this is a beautiful painting! beautiful..... and so simple ! It looks peaceful and quiet! Ahh, the simple life. thanks all now back to painting!